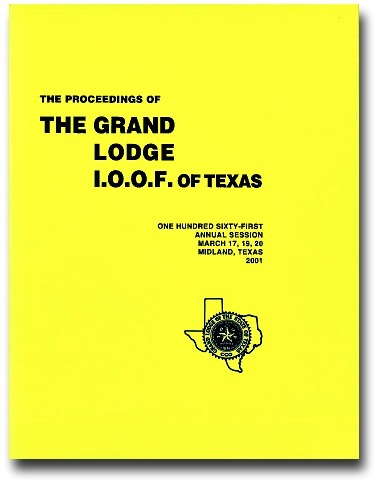 ﻿TO THE GRAND LODGE I.O.O.F. OF TEXAS: This year has been one of learning, education, friendship, love, and above all, truth. I shall be forever grateful for the privilege of serving as Grand Master for our great Order. It has been a very humbling experience working with all facets of our Order. It appears that out of our tenets such as friendship, love, and truth, the last is hardest to live up to and in some cases, is interfering with the good of the Order. The year started off fast but never let up. There was the visit in May to the Tomb of the Unknown Soldier which was one of the most impressive ceremonies I have ever witnessed. Meeting others of our Order there and discussing mutual problems was beneficial. I visited 60 lodges. (Some of them three or four times.) There were Degree rallies at eleven lodges and I attended nineteen funerals and was present at seventeen functions. I averaged 3;1 nights a week on lodge business, traveling something over 70,000 miles. All of this seems to have paid off because we rank first in the nation, Canada, Mexico, and Cuba in securing new members. The Order had some close financial calls due to circumstances beyond our control. However, this has apparently been corrected with new Directors at the Nursing Home and Retirement Home. We need to pay close attention to our lodge and return to the positive side of the ledger. Cuts need to be applied in certain areas. We must become financially viable as soon as possible. Again, I thank you for the privilege of serving you. It has been a very humbling experience. District officials believe the Fine Arts Program and its students foster the six principles he lives by — “those of friendship, love, truth, faith, hope and charity,” officials noted during the presentation. Before he became a beloved educator, Mr. Head served as a pilot in the European Theater during World War II. In fact, during a trip to Washington, D.C., Mr. Head Head shared the story that his journey to becoming a teacher began on June 6, 1944 — D-Day. I had the honor of being one of the guardians for the Ellis County Honor Flight trip taking about 50 World War II veterans from Ellis County to see their memorial in Washington. At breakfast on the final day of our trip, we asked the veterans to share their experiences. I will never forget what Mr. Head said about his experience during the war, and the promise he made to God. He was still a teenager on June 6, 1944. 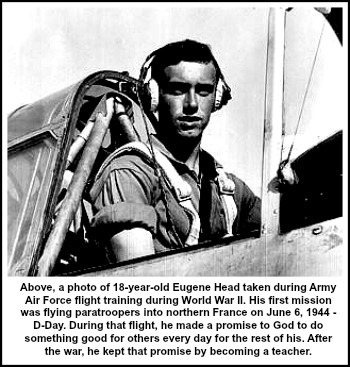 Fresh out of flight school, he was the pilot of a transport plane dropping paratroopers into northern France as part of the Normandy invasion. During the mission, his plane took more than 160 hits — one cutting a hole in the plane between him and the co-pilot. After the war, he became a teacher. And a surrogate father figure to scores of students. But he told every one of the nearly 30,000 students he taught and coached during his career they were his children — and that’s how he treated each and every one of them. In the stories many of those students have shared during the years, they recall how he taught them. They recall how he nurtured and guided them. They recall how he supported them emotionally and sometimes financially. And when needed, they recall how he provided discipline to keep them grounded. 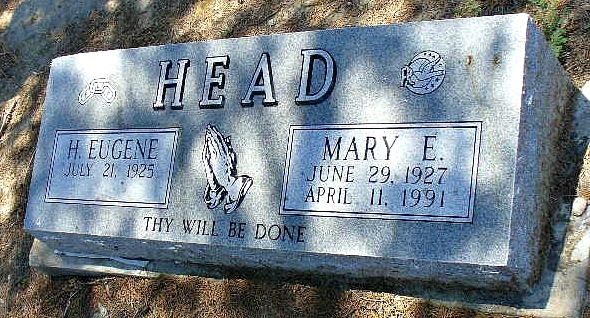 Every day, Mr. Head worked to keep the promise he made to God on June 6, 1944. “But in order to do that, I had to become a teacher,” he said. Just a few hours after his passing, numerous tributes have been posted on social media honoring the impact Mr. Head has made in the lives of others. No doubt, those tributes will multiply in the days to come as the community bids farewell to a beloved teacher, friend and mentor. A memorial service to celebrate Mr. Head’s life has been scheduled for 10 a.m. Friday, June 3, in the Pat Boze Memorial Chapel of Wayne Boze Funeral Home. His wife Ann is asking that memorials may be made in lieu of flowers to the charity of one’s choice. Past Grand Master Eugene Head passed away on May 31, 2016 after suffering a heart attack. His memorial service was held June 3, 2016 in Waxahachie, Texas. 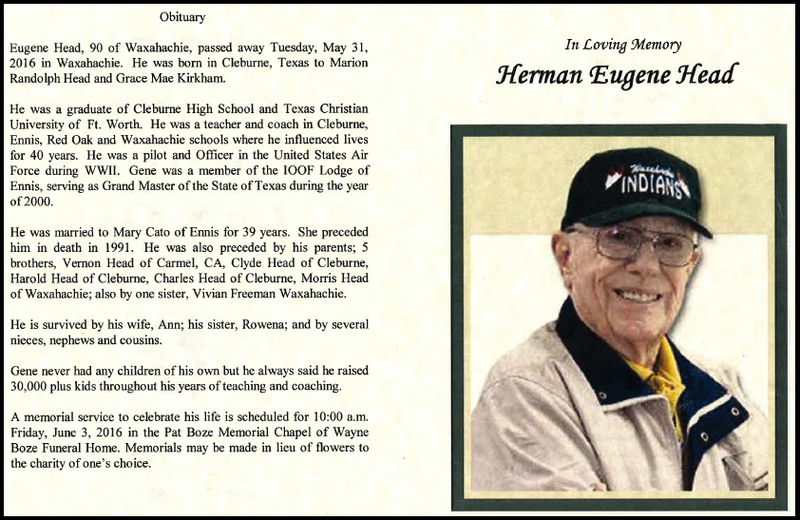 His wife, Ann, told us that just 2 weeks prior to his death, he attended a ceremony at the Waxahachie High School concerning their new school which will open in 2018. He and five other former teachers were chosen to have buildings named in their honor. The new Waxahachie High School auditorium will be named after Gene.